Many beginners often find their photographs are either underexposed (too dark) or overexposed (too light or white). 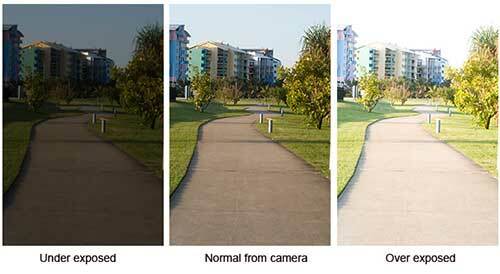 However, there is a way to manually change the exposure to compensate for them being darker or lighter. Getting the correct exposure balance isn’t as hard as it first seems, once you learn a few simple skills from the tips listed below. Where is the exposure compensation button on a digital SLR camera? On both Nikon and Canon digital SLR camera’s, the exposure compensation button looks like a plus and minus sign (+/-). On a Nikon D40, this is situated near the shutter button. For Canon 400D it is found upper right to the LCD screen on the back of the camera. How to use the exposure compensation button? The exposure compensation button can be used when your camera is in any non-automatic mode. For example, you can use it while your top dial is on P (for program), S (Nikon shutter priority), TV (Canon shutter priority), A or AV (aperture priority) and M (fully manual) modes. For this exercise, put your camera on the P mode and take one photograph. Now take a second photograph, this time firstly pressing the shutter button half way down to focus (lift up again), then hold down the +/- compensation button, while turning the main dial to the right 4 stops and shoot. Now look at both images one after another in the LCD screen and you should notice a difference in the lighting. Now repeat this exercise, this time when taking the 2nd photograph, hold down the compensation button down and turn the main dial 4 stops to the left. Note: it won’t need to always be 4 stops, this is an example to show extremes only. If you own a Nikon digital SLR camera, turning the main dial to the left (while holding down the exposure compensation button) will lighten the image. Whereas turning it to the right will darken the image for the next shot taken. You need to readjust it for each photograph. If you own a Canon digital SLR camera, it is the opposite to the Nikon. Turning your main dial to the left (while holding down the exposure compensation button) will darken the image and turning it to the right will lighten the image. When is exposure compensation useful? If at first, you take an image and it looks to be too dark or too light when viewing it in your LCD screen. For example if it is early morning or late evening, you might want the photograph to appear lighter (or darker) than it actually is. If you are taking a photograph of an object that is in actual fact too dark, and you want to lighten it. For example if you were taking an image of the underside of a car near the tyre. Bad example I know 🙂 Or lets say you want to photograph a black bird and need to see the actual eye in your image. In this case you could slightly over expose the image to bring out the patterns and shapes. In contrast, snow images can appear too over exposed. In these situations it’s recommended to underexpose the image until you see a nice balance between the sky and the snow. Exposure compensation is also useful for those people that photograph objects in a light tent. A light tent is a square box that has numerous colored backgrounds so photographers can capture products and objects with one background color. For example, if a white background is used and you don’t change the exposure compensation, the background may appear off white.